In 2013 while conducting a botanical survey along the shore beneath Clay Cliffs, two of our staff members came upon a pair of eagles. One, which looked to be an adult eagle, was trapped under a fallen tree limb. A juvenile, likely its offspring, was flapping its wings frantically in an attempt to pull the limb off the adult. As Derek Shiels and Emily Douglas approached the trapped bird, the juvenile flew off and they got a clear view of the trapped bird. As luck would have it, Derek was wearing a Go-Pro camera on his hat. While he and Emily acted quickly to free the bird, the entire rescue was caught on camera. Emily will never forget scrambling for the stick along the shore that Derek used to lift the limb and free the bird. She will never forget seeing the eagle with its six foot wingspan fly off into the lake, and then return to shore to rest and recover from its ordeal; seemingly fine. Five years later, I tagged along with Emily and other members of our stewardship staff on a visit to Clay Cliffs. The tasks at hand included clearing the trails of fallen trees, so there was some chain-sawing to be done. We also brought back a sign to repair and surveyed just how much garlic mustard was showing up along the trail. Finally, we were there to check on an eagle’s nest at Clay Cliffs to see if the pair was still inhabiting the nest. Places like Clay Cliffs provide ideal habitat for bald eagles, which prefer tall living trees close to water. Fish are a primary food source although they will eat small mammals such as squirrels. 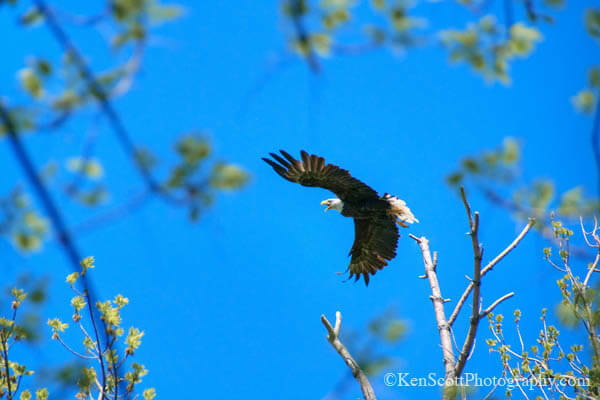 According to the Michigan Audubon Society, after nearly going extinct across the U.S., the number of nesting pairs of bald eagles in Michigan has doubled over the last 15 years. Widespread use of the pesticide DDT in the past wreaked havoc with the species, “causing neurological damage, brittle eggs, or just eggs that wouldn’t hatch,” says the Michigan Audubon Society’s Heather Good. 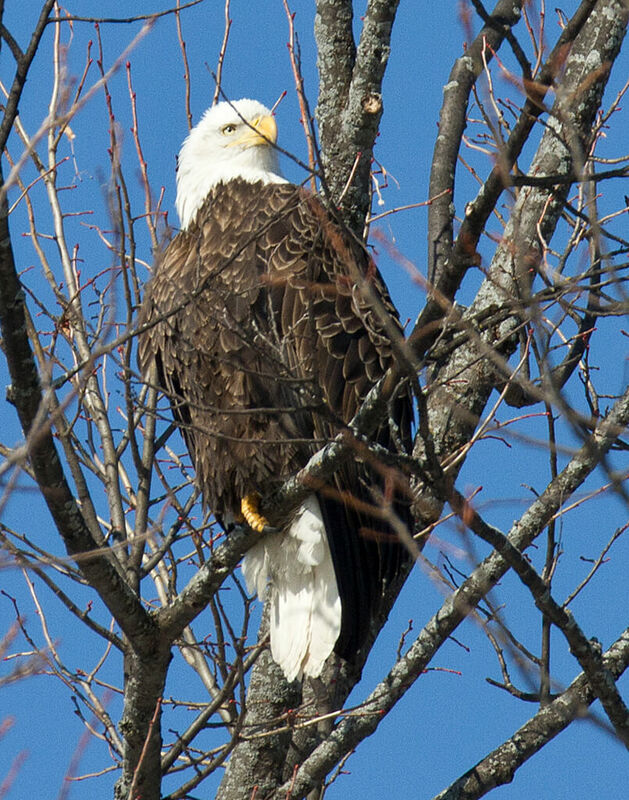 In the 1940s there were less than 40 pairs of nesting eagles; now there are more than 800. 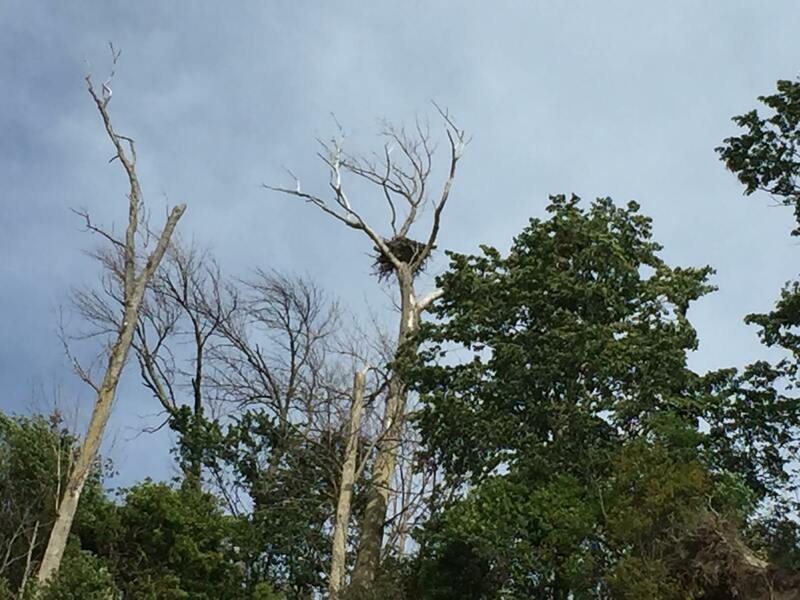 Although you might see an eagle swooping for their dinner as you stand on the Clay Cliffs overlook, the Conservancy doesn’t publicize the location of the nest. 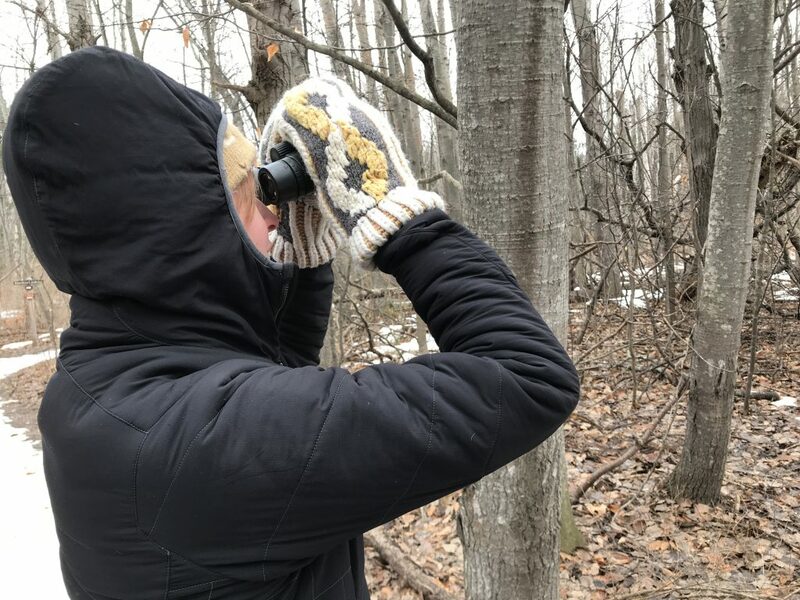 “That’s because if there is a lot of disturbance a nesting pair may abandon their chicks to find a more isolated location,” explains Emily as she adjusts her binoculars, and searches the canopy for the nest. Emily spots the eagle. Stewardship is what we call taking care of the land and water. But sometimes it means even more than that and in this case, looking after those who call our natural areas home. Eagles start building or adding to their nests in February and it isn’t until July that their young are fledged, at about 10 weeks old. Male and female eagles build their nest together as part of their courtship, adding sticks one to three months prior to mating, and lining it with moss and their own feathers. The average nest is huge–four to five feet in diameter and two to four feet deep. A pair of eagles will return to the same nest especially if they successfully raise their young at that location. With their pure white heads, intense eyes nearly the size of a human eyeballs, and giant sharp talons used to capture and destroy their prey, these creatures are fascinating. Learn more about bald and golden eagles: https://www.nationaleaglecenter.org. Thank you so much for featuring the article and video of the rescue of the Bald Eagle near Clay Cliffs. Eagle and rescuers are all fortunate to have met at the right moment.